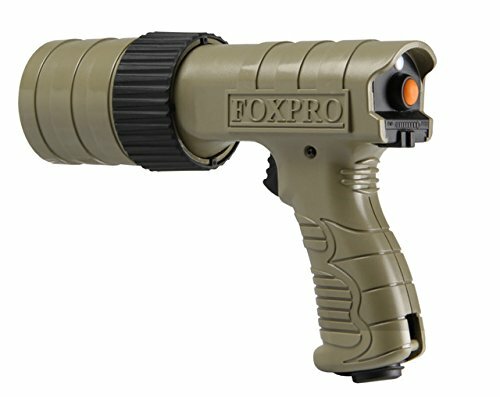 The FOXPRO Firefly is a single-color, high-intensity, LED Predator hunting light using the brightest LED's available today. The housing is the most ergonomic housing ever introduced to the hunting market. It is constructed from a High-strength plastic material for extreme durability and features a pistol style design for ease of use and comfort. Just like our digital game calls, and unlike most other Predator light companies, the FOXPRO fire fly is proudly made in the USA! the trigger on the fire fly is the on/off switch. It also features an instant maximum intensity button just below the trigger that achieves instant brightness when depressed, and then goes back to the preset brightness when released. This feature offers quick identification of animals at a distance with minimal movement. The fire fly features FOXPRO exclusive brightness control slider, offering extremely easy one handed operation of brightness control. The focus ring on the front of the fire fly allows you to narrow the beam for long range scanning, or widen the beam for tight, thick areas. Also featured on the fire fly is a battery check button and LED indicator for determining battery life. Simply Depress the button, and the LED blinks to indicate battery life left in the fire fly. The fire fly basic kit comes standard with the fire fly, a 3 cell 11.1 lithium Ion battery pack, and a wall charger.